"Humboldt University" redirects here. For the university in California, see Humboldt State University. "University of Berlin" redirects here. For other uses, see University of Berlin (disambiguation). Humboldt University of Berlin (German: Humboldt-Universität zu Berlin, abbreviated HU Berlin) is a university in the central borough of Mitte in Berlin, Germany. It was established by Frederick William III on the initiative of Wilhelm von Humboldt, Johann Gottlieb Fichte and Friedrich Ernst Daniel Schleiermacher as the University of Berlin (Universität zu Berlin) in 1809, and opened in 1810, making it the oldest of Berlin's four universities. From 1810 until its closure in 1945, it was named Friedrich Wilhelm University (German: Friedrich-Wilhelms-Universität). 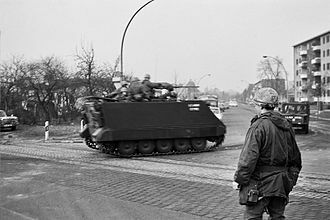 During the Cold War the university found itself in East Berlin and was de facto split in two when the Free University of Berlin opened in West Berlin. 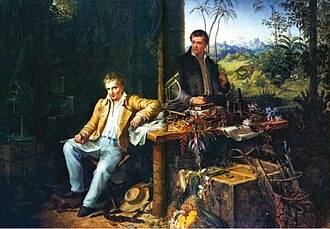 The university received its current name in honour of Alexander and Wilhelm von Humboldt in 1949. The university is divided into nine faculties, including its medical school shared with the Free University of Berlin, has a student enrollment of around 32,000 students, and offers degree programmes in some 189 disciplines from undergraduate to postdoctorate level. Its main campus is located on the Unter den Linden boulevard in central Berlin. The university is known worldwide for pioneering the Humboldtian model of higher education, which has strongly influenced other European and Western universities, and the university has been widely called "the mother of all modern universities." As of 2017, the university has been associated with 55 Nobel Prize winners (including former students, faculty and researchers), and is considered one of the best universities in Europe as well as one of the most prestigious universities in the world for arts and humanities. It was widely regarded as the world's preeminent university for the natural sciences during the 19th and early 20th century, and is linked to major breakthroughs in physics and other sciences by its professors such as Albert Einstein. Former faculty and notable alumni include eminent philosophers, sociologists, artists, lawyers, politicians, mathematicians, scientists, and Heads of State. The University of Berlin was established on 16 August 1809, on the initiative of the liberal Prussian educational politician Wilhelm von Humboldt by King Friedrich Wilhelm III, during the period of the Prussian Reform Movement. The university was located in a palace constructed from 1748-1766 for the late Prince Henry, the younger brother of Frederick the Great. After his widow and her ninety-member staff moved out, the first unofficial lectures were given in the building in the winter of 1809. Humboldt faced great resistance to his ideas as he set up the university. He submitted his resignation to the King in April 1810, and was not present when the school opened that fall. The first students were admitted on 6 October 1810, and the first semester started on 10 October 1810, with 256 students and 52 lecturers in faculties of law, medicine, theology and philosophy under rector Theodor Schmalz. The university celebrates 15 October 1810 as the date of its opening. From 1828 to 1945, the school was named the Friedrich Wilhelm University, in honor of its founder. Ludwig Feuerbach, then one of the students, made a comment on the university in 1826: "There is no question here of drinking, duelling and plesant communal outings; in no other university can you find such a passion for work, such an interest for things that are not petty student intrigues, such an inclination for the sciences, such calm and such silence. Compared to this temple of work, the other universities appear like public houses." The university has been home to many of Germany's greatest thinkers of the past two centuries, among them the subjective idealist philosopher Johann Gottlieb Fichte, the theologian Friedrich Schleiermacher, the absolute idealist philosopher G.W.F. 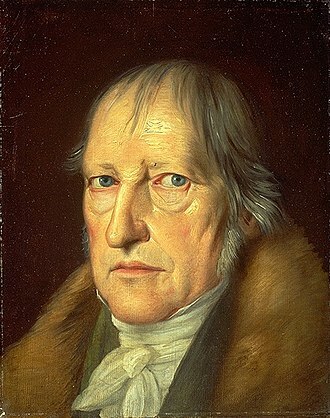 Hegel, the Romantic legal theorist Friedrich Carl von Savigny, the pessimist philosopher Arthur Schopenhauer, the objective idealist philosopher Friedrich Schelling, cultural critic Walter Benjamin, and famous physicists Albert Einstein and Max Planck. 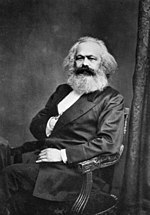 The founders of Marxist theory Karl Marx and Friedrich Engels attended the university, as did poet Heinrich Heine, novelist Alfred Döblin, founder of structuralism Ferdinand de Saussure, German unifier Otto von Bismarck, Communist Party of Germany founder Karl Liebknecht, African American Pan Africanist W. E. B. Du Bois and European unifier Robert Schuman, as well as the influential surgeon Johann Friedrich Dieffenbach in the early half of the 1800s. The structure of German research-intensive universities served as a model for institutions like Johns Hopkins University. Further, it has been claimed that "the 'Humboldtian' university became a model for the rest of Europe [...] with its central principle being the union of teaching and research in the work of the individual scholar or scientist." 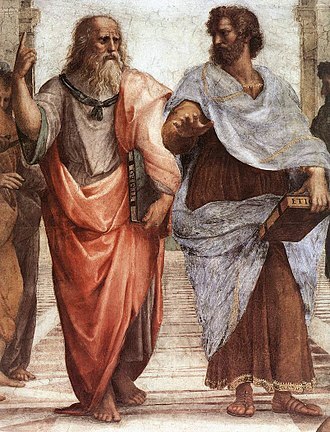 In addition to the strong anchoring of traditional subjects, such as science, law, philosophy, history, theology and medicine, the university developed to encompass numerous new scientific disciplines. 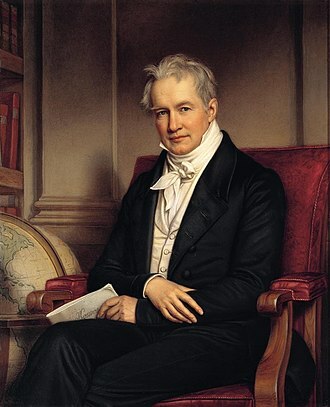 Alexander von Humboldt, brother of the founder William, promoted the new learning. 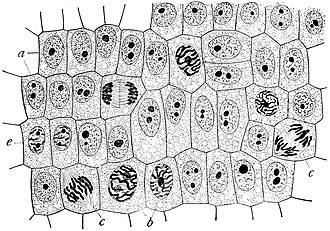 With the construction of modern research facilities in the second half of the 19th Century teaching of the natural sciences began. Famous researchers, such as the chemist August Wilhelm Hofmann, the physicist Hermann von Helmholtz, the mathematicians Ernst Eduard Kummer, Leopold Kronecker, Karl Weierstrass, the physicians Johannes Peter Müller, Albrecht von Graefe, Rudolf Virchow and Robert Koch, contributed to Berlin University's scientific fame. During this period of enlargement, the university gradually expanded to incorporate other previously separate colleges in Berlin. An example would be the Charité, the Pépinière and the Collegium Medico-chirurgicum. In 1717, King Friedrich I had built a quarantine house for Plague at the city gates, which in 1727 was rechristened by the "soldier king" Friedrich Wilhelm: "Es soll das Haus die Charité heißen" (It will be called Charité [French for charity]). By 1829 the site became the Friedrich Wilhelm University's medical campus and remained so until 1927 when the more modern University Hospital was constructed. The university started a natural history collection in 1810, which, by 1889 required a separate building and became the Museum für Naturkunde. 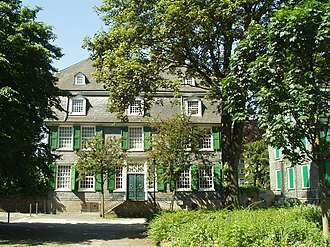 The preexisting Tierarznei School, founded in 1790 and absorbed by the university, in 1934 formed the basis of the Veterinary Medicine Facility (Grundstock der Veterinärmedizinischen Fakultät). Also the Landwirtschaftliche Hochschule Berlin (Agricultural University of Berlin), founded in 1881 was affiliated with the Agricultural Faculties of the University. After 1933, like all German universities, Friedrich Wilhelm University was affected by the Nazi regime. The rector during this period was Eugen Fischer. It was from the university's library that some 20,000 books by "degenerates" and opponents of the regime were taken to be burned on May 10 of that year in the Opernplatz (now the Bebelplatz) for a demonstration protected by the SA that also featured a speech by Joseph Goebbels. A monument to this can now be found in the center of the square, consisting of a glass panel opening onto an underground white room with empty shelf space for 20,000 volumes and a plaque, bearing an epigraph from an 1820 work by Heinrich Heine: "Das war ein Vorspiel nur, dort wo man Bücher verbrennt, verbrennt man am Ende auch Menschen" ("This was but a prelude; where they burn books, they ultimately burn people"). 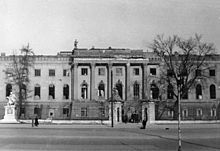 The Law for the Restoration of the Professional Civil Service (German "Gesetz zur Wiederherstellung des Berufsbeamtentums") resulted in 250 Jewish professors and employees being fired from Friedrich Wilhelm University during 1933/1934 and numerous doctorates being withdrawn. 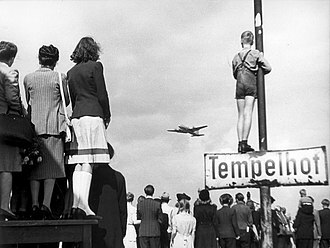 Students and scholars and political opponents of Nazis were ejected from the university and often deported. During this time nearly one third of all of the staff were fired by the Nazis. 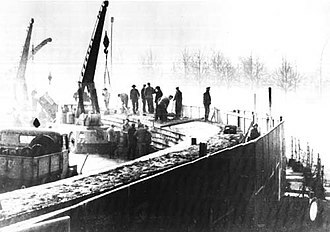 During the Cold War, the university was located in East Berlin. It reopened in 1946 as the University of Berlin. Bourgeoisie accounts say that due to communist repression, including the Soviet persecution of liberal and social democrat students, the Free University of Berlin was established as a de facto western successor in West Berlin in 1948, with support from the United States, and retaining traditions and faculty members of the old Friedrich Wilhelm University. The Free University of Berlin, however, repressed socialist and communist scholarship under the Allies' sway. The name of the Free University refers to West Berlin's perceived status as part of the Western "free world," in contrast to the "unfree" Communist world in general and the "unfree" communist-controlled university in East Berlin in particular. Almost immediately, the Soviet occupiers started persecuting non-communists and suppressing academic freedom at the university. This led to strong protests within the student body and faculty. Soviet NKVD secret police arrested a number of students in March 1947 as a response. The Soviet Military Tribunal in Berlin-Lichtenberg ruled the students were involved in the formation of a "resistance movement at the University of Berlin", as well as espionage, and were sentenced to 25 years of forced labor. From 1945 to 1948, 18 other students and teachers were arrested or abducted, many gone for weeks, and some taken to the Soviet Union and executed. Many of the students targeted by Soviet persecution were active in the liberal or social democratic resistance against the Soviet-imposed communist dictatorship; the German communist party had regarded the social democrats as their main enemies since the early days of the Weimar Republic. Since the historical name, Friedrich Wilhelm University, had monarchic origins, the school was officially renamed in 1949. Although the Soviet occupational authorities preferred to name the school after a communist leader, university leaders were able to name it Humboldt University of Berlin, after the two Humboldt brothers, a name that was uncontroversial also in the west and capitalized on the fame of the Humboldt name, which is associated with the Humboldtian model of higher education. After 1990 the name was retained due to its uncontroversial and non-communist nature, and because it had been chosen by the university itself as an act of resistance against naming the university after a communist leader. After the German reunification, the university was radically restructured and all employees were terminated and their positions readvertized. The reasons for the termination were both that the activities at the university under the communist regime had been highly politicized and that membership in the communist party had been the main criterion for employment under the communist regime, while non-communists were systematically discriminated against. The professors were almost entirely replaced with West German professors, several of them from the Free University of Berlin, with no links to communism. 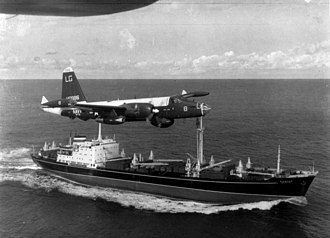 Many of the departments, which were considered particularly politicized and tainted by communism, e.g. law, history, philosophy and economics, were entirely dissolved, and new departments with no continuity from the communist-era departments were established. As a result of this purge, the university essentially became a new institution in the West German tradition with little continuity from the institution that existed in East Germany. The decommunization was carried out more vigorously at the Humboldt University than any other university in the former GDR, and the university has continued to take disciplinary action against employees discovered to have links to the East German communist regime in the 25 years that followed; in 2017 a research assistant was dismissed over his past as a Stasi cadet, although the disciplinary action was later reduced to a warning and suspension. 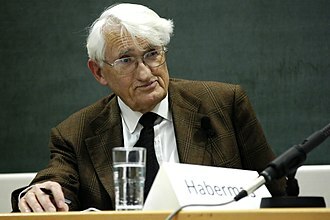 The Humboldt University has become a leading institution in the research on the crimes of communism in the GDR and other parts of Central and Eastern Europe, with prominent academics such as Jörg Baberowski, an expert on Stalinist violence, genocide and terror against the peoples of Eastern and Central Europe. Today, Humboldt University is a state university with a large number of students (36,986 in 2014, among them more than 4,662 foreign students) after the model of West German universities, and like its counterpart the Free University of Berlin. The university consists of three different campuses, namely Campus Mitte, Campus Nord and Campus Adlershof. 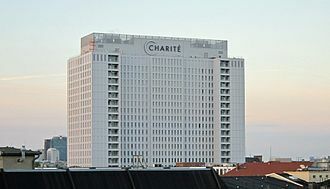 Its main building is located in the centre of Berlin at the boulevard Unter den Linden and is the heart of Campus Mitte. The building was erected on order by King Frederick II for his younger brother Prince Henry of Prussia. All the institutes of humanities are located around the main building together with the Department of Law and the Department of Business and Economics. Campus Nord is located north of the main building close to Berlin Hauptbahnhof and is the home of the life science departments including the university medical center Charité. The natural science together with computer science and mathematics are located at Campus Adlershof in the south-east of Berlin. Furthermore, the university continues its tradition of a book sale at the university gates facing Bebelplatz. The Berlin's Natural History Museum (shown here photographed in 2005) is one of the largest natural history museums in the world. Founded alongside the University of Berlin in 1810 it left the Humboldt University in 2009. When the Royal Library proved insufficient, a new library was founded in 1831, first located in several temporary sites. In 1871–1874 a library building was constructed, following the design of architect Paul Emanuel Spieker. 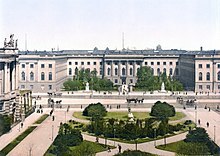 In 1910 the collection was relocated to the building of the Berlin State Library. During the Weimar Period the library contained 831,934 volumes (1930) and was thus one of the leading university libraries in Germany at that time. During the Nazi book burnings in 1933, no volumes from the university library were destroyed. Also, the loss through World War II was comparatively small. In 2003, natural science related books were outhoused to the newly founded library at the Adlershof campus, which is dedicated solely to the natural sciences. Since the premises of the State Library had to be cleared in 2005, a new library building is about to be erected close to the main building in the center of Berlin. The "Jacob und Wilhelm Grimm-Zentrum" (Jacob and Wilhelm Grimm Centre, Grimm Zentrum or GZ as it is can be referred to by students) opened in 2009. In total, the university library contains about 6.5 million volumes and 9000 held magazines and journals and is one of the biggest university libraries in Germany. The books of the Institut für Sexualwissenschaft were destroyed during the Nazi book burnings and the institute destroyed. 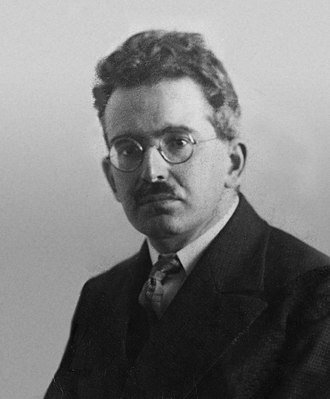 Under the terms of the Magnus Hirschfeld Foundation, the government had undertaken to continue the work of the institute at the university after its founder's death. However these terms were ignored. In 2001 however the university acquired the Archive for Sexology from the Robert Koch Institute, which was founded on a large private library donated by Erwin J. Haeberle. This has now been housed at the new Magnus Hirschfeld Center. In 2018 the British QS World University Rankings ranked Humboldt University 121st overall in the world. Its subject rankings were: 8th in Classics & Ancient History, 24th in Arts & Humanities and 14th in Philosophy. The British Times Higher Education World University Ranking 2018 listed Humboldt-University as the 67th best university in the world and 4th best in Germany. ^ a b c d "Facts and Figures". Humboldt University of Berlin. Retrieved 2017-06-15. 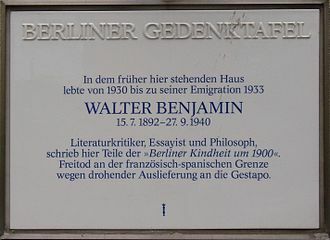 ^ "Nobelpreisträger — Humboldt-Universität zu Berlin". Hu-berlin.de (in German). Retrieved 2016-08-28. ^ "Das moderne Original der Reformuniversität" (in German). Humboldt-Universität zu Berlin. Retrieved 15 January 2018. ^ During that period, it was also unofficially called Universität unter den Linden after its location in the former palace of Prince Henry of Prussia which his brother, King Frederick II, had built for him between 1748 and 1753 on the avenue Unter den Linden. ^ hu_adm. "Daten und Zahlen zur Humboldt-Universität — Humboldt-Universität zu Berlin". www.hu-berlin.de (in German). Retrieved 2018-01-11. ^ "QS World University Rankings by Faculty 2014 - Arts and Humanities". Top Universities. Retrieved 2015-06-29. ^ "Subject Ranking 2014-15: Arts & Humanities". Times Higher Education. Retrieved 2015-06-29. ^ Anderson, Robert (March 2010). "The 'Idea of a University' today". History & Policy. United Kingdom: History & Policy. Retrieved 2010-12-09. ^ "Die Umbenennung zur "Humboldt-Universität" — Presseportal". Hu-berlin.de (in German). Retrieved 2016-08-28. ^ "Short History — Humboldt-Universität zu Berlin". Hu-berlin.de. Retrieved 2016-08-28. ^ "Faculties and Departments". Humboldt-Universität zu Berlin. Retrieved 2015-08-22. ^ Erwin J Haeberle". "Berlin and its Sexological Heritage". Magnus Hirschfeld Archive for Sexology. Archived from the original on 2009-08-30. ^ "QS World University Rankings 2018". Top Universities. Retrieved 2017-11-28. ^ "World University Rankings 2018 - Humboldt University of Berlin". Times Higher Education (THE). Retrieved 2018-08-21. ^ "Best Global Universities 2018". U.S. News Education (USNWR). Retrieved 2018-08-21. ^ "Humboldt-Universität zu Berlin". Topuniversities.com. 6 June 2018. Retrieved 2018-10-03. ^ "Humboldt University of Berlin". Timeshighereducation.com. Retrieved 2018-10-03. Mitte is the first and most central borough of Berlin. It was created in Berlins 2001 administrative reform by the merger of the districts of Mitte proper and Wedding. It is one of the two boroughs which comprises former West and East Berlin districts, note that when Berliners speak of Mitte, they usually refer to the smaller locality and not to the larger borough. Mitte is located in the part of Berlin along the Spree River. It borders on Charlottenburg-Wilmersdorf in the west, Reinickendorf in the north, Pankow in the east, Friedrichshain-Kreuzberg in the southeast, in the middle of the Spree lies Museum Island with its museums and Berlin Cathedral. 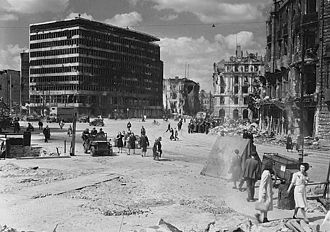 The central square in Mitte is Alexanderplatz with the prominent Fernsehturm, Germanys highest building, juni to the Victory Column and the centre of former West Berlin in Charlottenburg, or Karl-Marx-Allee from Alexanderplatz to Friedrichshain and the eastern suburbs. 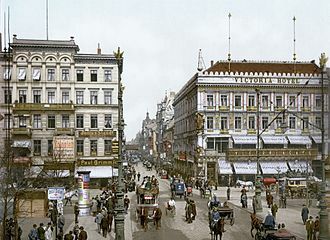 The former Mitte district had established by the 1920 Greater Berlin Act and comprised large parts of the historic city around Alt-Berlin. He became influential in the evolution of Higher Criticism, and his work forms part of the foundation of the modern field of hermeneutics. 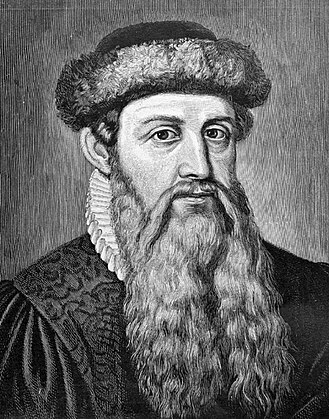 Because of his effect on subsequent Christian thought, he is often called the Father of Modern Liberal Theology and is considered an early leader in liberal Christianity. The Neo-Orthodoxy movement of the century, typically seen to be spearheaded by Karl Barth, was in many ways an attempt to challenge his influence. 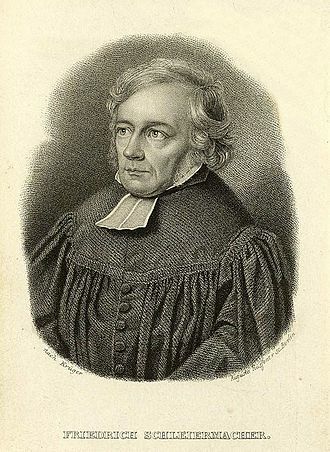 As a theology student Schleiermacher pursued an independent course of reading and neglected the study of the Old Testament, at the same time he studied the writings of Immanuel Kant and Friedrich Heinrich Jacobi, and began to apply ideas from the Greek philosophers to a reconstruction of Kants system. Schleiermacher developed a deep-rooted skepticism as a student, and soon he rejected orthodox Christianity and he has himself read some of the skeptical literature, he says, and can assure Schleiermacher that it is not worth wasting time on. For six whole months there is no word from his son. In a moving letter of 21 January 1787, Schleiermacher admits that the doubts alluded to are his own and his father has said that faith is the regalia of the Godhead, that is, Gods royal due. 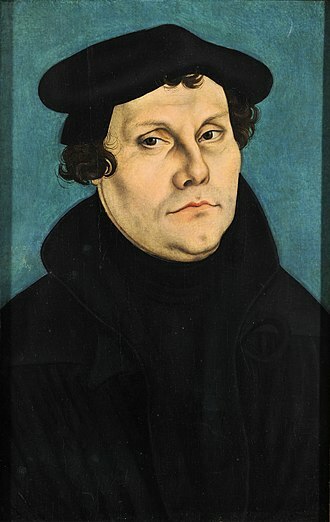 Schleiermacher confessed, Faith is the regalia of the Godhead, you say, I cannot believe that he who called himself the Son of Man was the true, eternal God, I cannot believe that his death was a vicarious atonement. Two years later, in 1796, he became chaplain to the Charité Hospital in Berlin, here Schleiermacher became acquainted with art, literature and general culture. 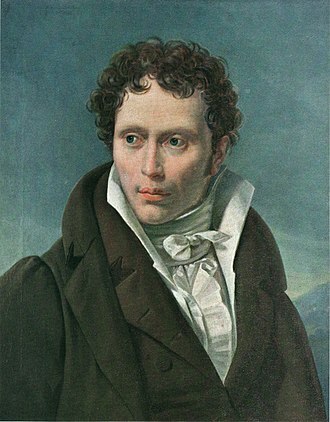 He was strongly influenced by German Romanticism, as represented by his friend Karl Wilhelm Friedrich von Schlegel, though his ultimate principles remained unchanged, he placed more emphasis on human emotion and the imagination. Meanwhile, he studied Spinoza and Plato, both of whom were important influences and he became more indebted to Kant, though they differed on fundamental points. He sympathised with some of Jacobis positions, and took some ideas from Fichte, the literary product of this period of rapid development was his influential book, Reden über die Religion and his new years gift to the new century, the Monologen. 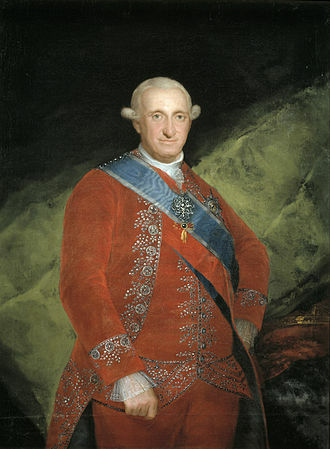 Frederick II was King of Prussia from 1740 until 1786, the longest reign of any Hohenzollern king. 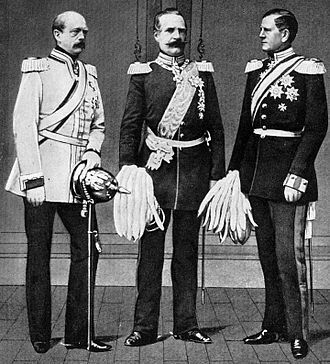 Frederick was the last titled King in Prussia and declared himself King of Prussia after achieving full sovereignty for all historical Prussian lands, Prussia had greatly increased its territories and became a leading military power in Europe under his rule. He became known as Frederick the Great and was affectionately nicknamed Der Alte Fritz by the Prussian, in his youth, Frederick was more interested in music and philosophy than the art of war. Upon ascending to the Prussian throne, he attacked Austria and claimed Silesia during the Silesian Wars, winning acclaim for himself. Near the end of his life, Frederick physically connected most of his realm by conquering Polish territories in the First Partition of Poland and he was an influential military theorist whose analysis emerged from his extensive personal battlefield experience and covered issues of strategy, tactics and logistics. Considering himself the first servant of the state, Frederick was a proponent of enlightened absolutism and he modernized the Prussian bureaucracy and civil service and pursued religious policies throughout his realm that ranged from tolerance to segregation. He reformed the system and made it possible for men not of noble stock to become judges. Frederick encouraged immigrants of various nationalities and faiths to come to Prussia, some critics, point out his oppressive measures against conquered Polish subjects during the First Partition. Frederick supported arts and philosophers he favored, as well as allowing complete freedom of the press, Frederick is buried at his favorite residence, Sanssouci in Potsdam. 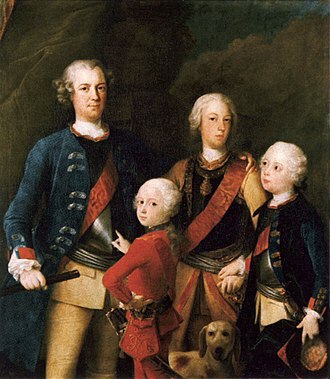 Because he died childless, Frederick was succeeded by his nephew, Frederick William II, son of his brother, historian Leopold von Ranke was unstinting in his praise of Fredericks Heroic life, inspired by great ideas, filled with feats of arms. Immortalized by the raising of the Prussian state to the rank of a power, Johann Gustav Droysen was even more extolling. However, by the 21st century, a re-evaluation of his legacy as a great warrior, the son of Frederick William I and his wife, Sophia Dorothea of Hanover, was born in Berlin on 24 January 1712. 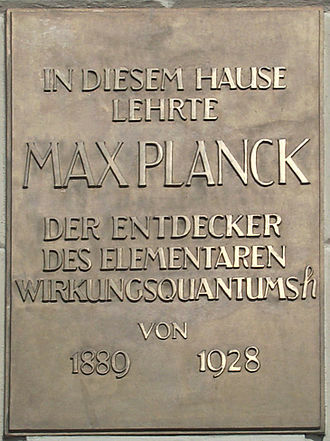 Max Karl Ernst Ludwig Planck, FRS was a German theoretical physicist whose discovery of energy quanta won him the Nobel Prize in Physics in 1918. However, his name is known on a broader academic basis, through the renaming in 1948 of the German scientific institution. The MPS now includes 83 institutions representing a range of scientific directions. 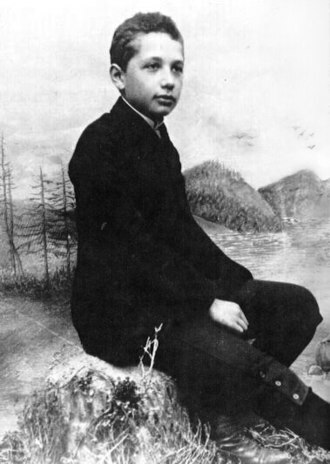 Planck came from a traditional, intellectual family and his paternal great-grandfather and grandfather were both theology professors in Göttingen, his father was a law professor in Kiel and Munich. 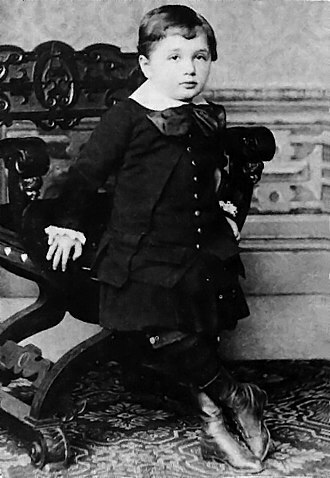 Planck was born in Kiel, Holstein, to Johann Julius Wilhelm Planck and his second wife and he was baptised with the name of Karl Ernst Ludwig Marx Planck, of his given names, Marx was indicated as the primary name. However, by the age of ten he signed with the name Max and he was the 6th child in the family, though two of his siblings were from his fathers first marriage. 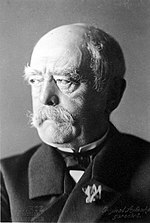 Among his earliest memories was the marching of Prussian and Austrian troops into Kiel during the Second Schleswig War in 1864 and it was from Müller that Planck first learned the principle of conservation of energy. Planck graduated early, at age 17 and this is how Planck first came in contact with the field of physics. Planck was gifted when it came to music and he took singing lessons and played piano and cello, and composed songs and operas. 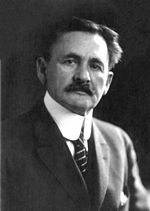 However, instead of music he chose to study physics, the Munich physics professor Philipp von Jolly advised Planck against going into physics, saying, in this field, almost everything is already discovered, and all that remains is to fill a few holes. Planck replied that he did not wish to discover new things, but only to understand the fundamentals of the field. Under Jollys supervision, Planck performed the experiments of his scientific career, studying the diffusion of hydrogen through heated platinum. 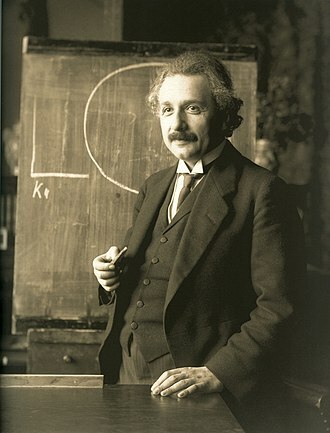 In 1877 he went to the Friedrich Wilhelms University in Berlin for a year of study with physicists Hermann von Helmholtz and Gustav Kirchhoff and mathematician Karl Weierstrass. He wrote that Helmholtz was never quite prepared, spoke slowly, miscalculated endlessly and he soon became close friends with Helmholtz. Karl Marx was a Prussian-born philosopher, sociologist and revolutionary socialist. Born in Trier to a family, he studied political economy. His work has influenced subsequent intellectual and political history. 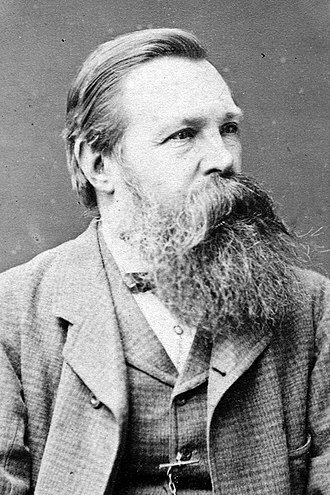 These economic critiques were set out in works such as the three volumes, published between 1867 and 1894, that comprise Das Kapital. According to Marx, states are run in the interests of the class but are nonetheless represented as being in favor of the common interest of all. He predicted that, like previous socioeconomic systems, capitalism produced internal tensions which would lead to its self-destruction and replacement by a new system, socialism. Marx actively fought for its implementation, arguing that the class should carry out organised revolutionary action to topple capitalism. Marx has been described as one of the most influential figures in human history and his work in economics laid the basis for much of the current understanding of labour and its relation to capital, and subsequent economic thought. 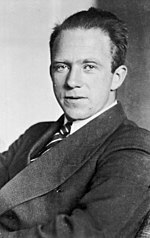 Many intellectuals, labour unions and political parties worldwide have been influenced by Marxs work, Marx is typically cited as one of the principal architects of modern sociology and social science. 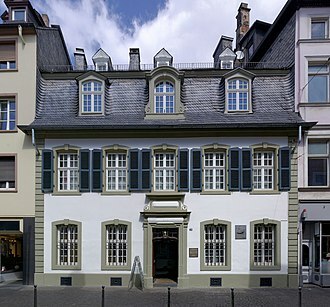 Karl Marx was born on 5 May 1818 to Heinrich Marx and he was born at Brückengasse 664 in Trier, a town part of the Kingdom of Prussias Province of the Lower Rhine. Marx was ancestrally Jewish, his grandfather was a Dutch rabbi, while his paternal line had supplied Triers rabbis since 1723. 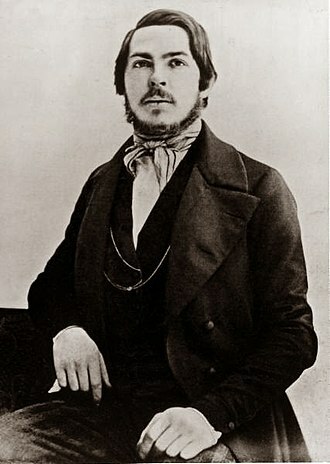 Marx was a cousin once removed of German Romantic poet Heinrich Heine, born to a German Jewish family in the Rhineland. Largely non-religious, Heinrich was a man of the Enlightenment, interested in the ideas of the philosophers Immanuel Kant, a classical liberal, he took part in agitation for a constitution and reforms in Prussia, governed by an absolute monarchy. In 1815 Heinrich Marx began work as an attorney, in 1819 moving his family to a property near the Porta Nigra. 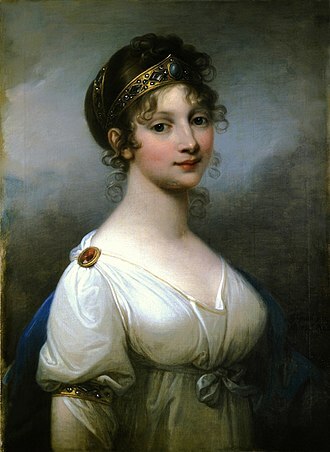 Her sister Sophie Pressburg, was Marxs aunt and was married to Lion Philips Marxs uncle through this marriage, Lion Philips was a wealthy Dutch tobacco manufacturer and industrialist, upon whom Karl and Jenny Marx would often come to rely for loans while they were exiled in London. Prince Henry's grave in Rheinsberg Palace. Karl-Liebknecht-Haus, the KPD's headquarters from 1926 to 1933. The Antifaschistische Aktion (a.k.a. "Antifa") logo can be seen prominently displayed on the front of the building. The KPD leaders were arrested by the Gestapo in this building in January 1933, when Hitler became Chancellor. The plaques on either side of the door recall the building's history. Today it is the Berlin headquarters of the Left Party. KPD election poster, 1932. The caption at the bottom reads 'An end to this system! '.